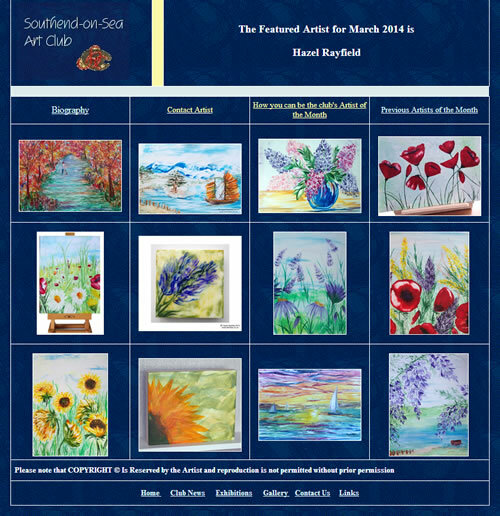 There is a bit of excitement here @ Art In Wax as I am the featured artist for March at the Southend Art Club. Last year I joined the Southend Art Club and was recently asked if I would like to be “Artist of the Month” for March 2014 and I was delighted to accept. The Southend Art Club has a long history in the town and was established in 1929. Then known as the Southend Art Circle it was set up to promote art in the Southend area, a change of name to The Southend Sketch Club came later in 1969 renamed again as it is today Southend Art Club (SAC). There are a selection of my encaustic paintings included on the SAC website in the Artist of the Month feature. Including some of my hot wax pictures on gloss card and some of my wax on wood pieces. The SAC feature looks good Hazel, well done, and well deserved. Congratulations Hazel. The determination you continuously express to enjoy the encaustic creativity that flows through you is self evident. Well done to you.